If you are building a new home in a rural part of Rogers, MN, have bought a fixer upper or have a Damaged Septic System you will need a Certified and Insured Septic Installer. CSI Custom Septic, Inc. has all of the qualifications including Septic Installation License, Insurance, Experience, Equipment and References to vouch for our excellent work. 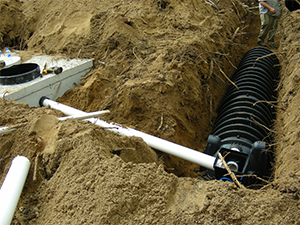 There is so much more involved in Designing and Installing a septic tank and drainfield that the job requires a Residential Septic System Installer that knows exactly what they are doing. The purpose of a Residential Septic Tank System is to safely collect, treat and distribute all of the water and sewer generated in a home. The Organic Sewage Treatment Process that goes on inside of the septic tank and through the soil drain field requires the correct configuration of all elements in order to be successful. A failed drainfield, busted sewer pipe or malfunctioning septic tank could cause a public health risk and big expense for the homeowner. Any breakdown in the design or installation process can result in significant problems in the future. Science plays a big role in determining the Best Septic System Design for each individual property. A Certified Septic Designer will examine the property, test the soil, check for setback requirements for structures and wells. They will also need to know how much wastewater will be processed through the septic tank on a regular basis. Once the Septic Design has been approved the next phase of the Septic System Installation is the building permit. Your septic installer will need to have equipment that is used to excavate and install every component according to Rogers, Minnesota septic system compliance standards. The entire system can be put in and up and running in a relatively short amount of time. A well maintained Residential Septic System and last for decades with proper care. Certified Septic Design and Installation Companies like CSI Custom Septic, Inc. are educated on ways to determine the best type of system, the location for each component, size of septic tanks and soil treatment areas and how to build the whole system according to local and state standards. Your Home Septic System is in good hands with CSI Custom Septic, Inc. We invite you to check out our Certification and References and know that we are fully Insured and Bonded with more than 20 years of experience with Minnesota Septic Systems. In Rogers MN and the surrounding Minnesota towns, contact CSI Custom Septic, Inc. for Experienced Septic System Installation at 763-218-4769.